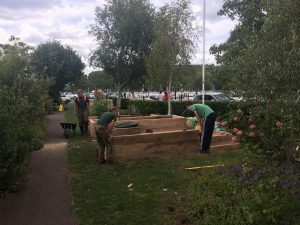 Dartmouth Caring has been working in partnership with Dartmouth Green Partnerships and naval cadets from BRNC to revamp the raised beds at the potager community garden on the river front. The cadets worked with Eddie Church and his staff to remove old timbers and install new oak sleepers, transforming the raised beds to allow access by people with mobility issues. This work was made possible following the generosity of the Elise Pilkington Charitable Trust and from Naturesave from whom Dartmouth Caring received two grants to help expand its work in the community. 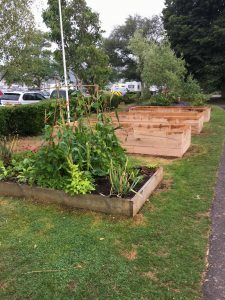 Many of Dartmouth Caring’s older clients no longer have access to a garden, or indeed any kind of outside space and the work carried out by DGP and the naval cadets will help to address this problem. The benefits of access to outdoor facilities for older people is well-documented; a research paper published in Science Daily states that it is ‘. . . important to the quality of later life by decreasing boredom, isolation and loneliness’. Addressing the problems caused by loneliness has been one of Dartmouth Caring’s key areas of focus in the last year and the charity is therefore very excited by this latest development. 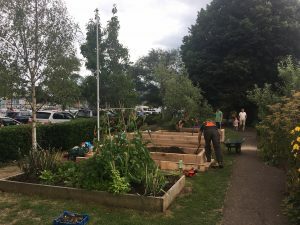 The work carried out in the community garden will benefit the whole of the local community and Dartmouth Caring is extremely grateful to DGP and the naval cadets for helping to bring this project to fruition. The cadets also helped DGP remove a large amount of waste from the site. It is with thanks to the Elsie Pilkington Charitable Trust and The Naturesave Trust – Funding Environmental, Conservation and Community Renewable Energy projects throughout the UK, that this project has come about.